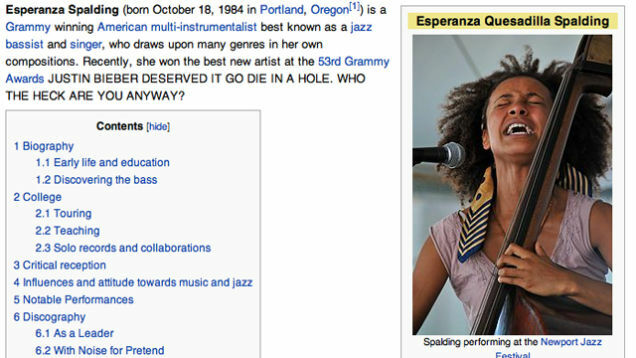 Her middle name is "Quesadilla"
"She now has the 2011 Grammy for being the Best new Artist! Even though no one has ever heard of her! Yay!" "HaHa Justin Bieber, you're just a little boy with no Grammy for Best New Artist.irehjbpojeh[ker"
"(Dan cannot believe the Biebs did not win)"
Poor Ms. Spalding! We can only imagine what it's like to have thousands of people trying to kill you with their minds. You can check out all of the vandalisms by going here and clicking "next edit" to your heart's content.